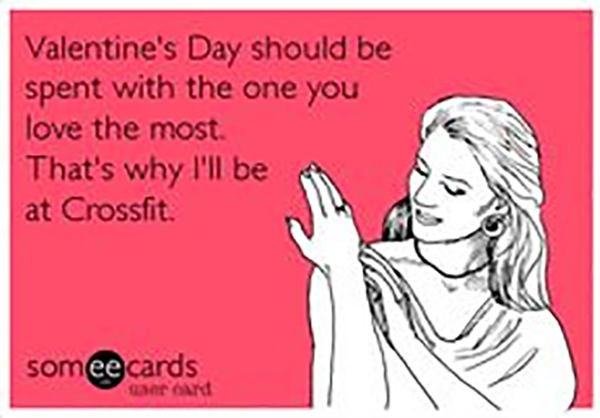 If you’re all about sharing your WOD, brotherly love, romance and/or teamwork making the dream work….find a Valentine and get to work. Decide who’s doing which chipper. Only one works at a time, and each must go in order in their own work out. Partner Carry to buy in and buy out to finish the WOD. No helping with your partner’s chipper, so try to time it so you’re finished together! If you’re a loner, not into group projects, independent, living your best life on your own right now and/or playing the field, pick your favorite chipper and get to it. Instead of the partner carry, start and finish with a double KB farmer carry.